But if you’re thinking of matching your make-up to the night sky, let me whisper a few words of warning: Sparkly make-up is not an easy look to pull off. Apply too much glitter and you’ll end up looking like a creative teenager, apply too little and nobody will even notice. The key to wearing sparkle is to keep the look balanced, grown-up, and sophisticated. The first rule is to pick one product – one product only – and stick to it. Sorry girls, but a sparkly base, pout, flutter, and wave is way. too. much. 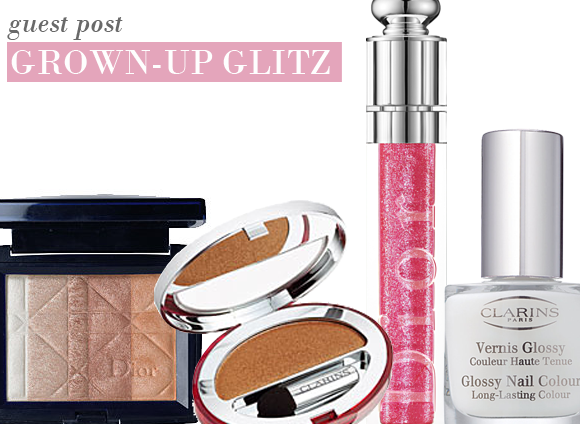 One of my favourite ways to wear sparkle is with a dusting of shimmering face powder. It’s subtle, yet instantly boosts radiance. Dior Ultra-Shimmering All Over Face Powder, £30 is ideal. Pale skin tones should pick Rose Diamond, whilst darker complexions should opt for Amber Diamond. Sweep it over your entire complexion after applying base and watch as your complexion instantly lights up. Metallic is another huge trend for Autumn/Winter – so if you decide to glam up your eyelids with a touch of sparkle, pick a shade of bronze, silver, or gold. The golden rule here (excuse the pun) is to apply an eyelid primer first, which will show off your chosen shade of shadow to its full potential. Next, blend the colour from the crease of your lids, right down to the lash line. I adore Clarins Single Eye Colour, £13.50, in Gold Leaf. If all-over colour is too much, give eyes a hint of shimmer by defining with a glitter-infused eyeliner, such as Guerlain Terracotta Fard Metal Eye Shadow & Liner, £19 in either Gold Rush or Smoky Metal. The fine mother-of-pearl particles reflect the light, yet the look remains stylish and sophisticated. Line the upper-lid, with a sultry flick – and for big nights out, add a sweep to the bottom lash line. One of the easiest ways to wear sparkle, of course, is with lip-gloss – and if you prefer a natural look, this is the product to opt for. Keep the look simple by applying straight onto bare lips – or add interest to a bright lipstick by applying on top. Dior Flash-Plumping Spotlight Shine Lipgloss, £19.50, is perfect for the job – and it comes in a impressive array of shades, from the pretty Lace Beige to the eye-popping Outrageous Fuchsia. Finally, let your nails in on the action, with a polish packed with shimmer particles. It’s a big trend this season, with all the top nailcare brands adding glittery polishes to their collections – and I love few better than Clarins’ Glossy Nail Colour, £13 in Shimmer Pink. Have had this before lovely powder and colour its a shame they have discontinued it. This entry was posted on Monday, November 1st, 2010 at 10:12 am and is filed under Guest bloggers, Make-up. You can follow any responses to this entry through the RSS 2.0 feed. You can skip to the end and leave a response. Pinging is currently not allowed.